Fear of the unknown—it is the essence of the best horror stories, the need to know what monstrous vision you’re beholding and the underlying terror that you just might find out. Now, twenty authors have gathered to ask—and maybe answer—a question worthy of almost any horror tale: “What the #@&% is that?” Join these masters of suspense as they take you to where the shadows grow long, and that which lurks at the corner of your vision is all too real. Includes stories by Laird Barron, Amanda Downum, Scott Sigler, Simon R. Green, Desirina Boskovich, Isabel Yap, Maria Dahvana Headley, Christopher Golden, John Langan, D. Thomas Minton, Seanan McGuire, Grady Hendrix, Jonathan Maberry, Gemma Files, Nancy Holder, Adam-Troy Castro, Terence Taylor, Tim Pratt, An Owomoyela & Rachel Swirsky, and Alan Dean Foster. Praise for What the #@&% Is That? If you’re looking for a read (or lots of reads, as the case may be) that’s equally fun, scary, and thought-provoking, then What the #@&% Is That? will be up your alley. With editors as experienced as John Joseph Adams and Douglas Cohen, I’d be surprised if most horror/sci-fi fans don’t enjoy it. The only rating I could possibly give the book is five [out of five] stars. [An] amazing collection […] ranging from hilarious to truly terrifying […] a great option to hand to horror fans. This anthology’s fusion of literary horror and emotional/psychological depth will appeal to readers tired of formulaic genre fiction. 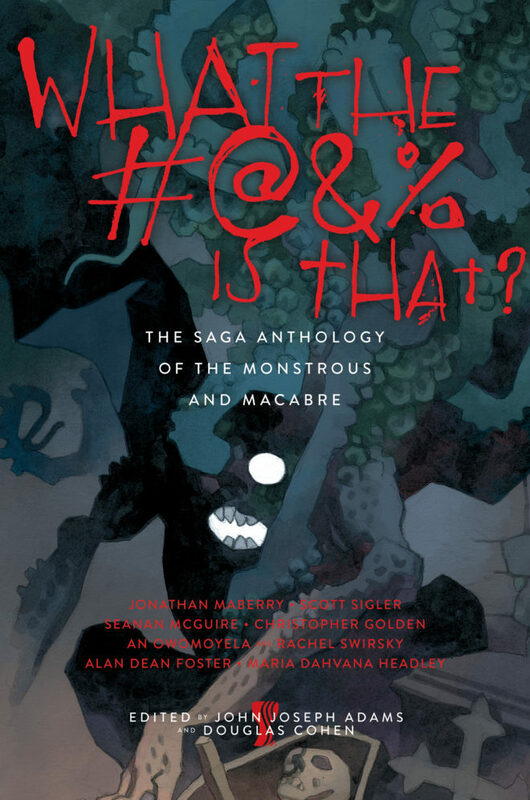 A really intriguing, spooky anthology [with] an incredible table of contents. If you derive any sort of pleasure from the grotesque, the fanciful, the freakish and unnatural, buy this book. The wide range of styles, genres, and themes in What the #@&% Is That? make it perfect for finding a new favorite author or discovering upcoming voices in fiction. The three stories mentioned [in our review] are from three newer writers, yet they are some of the strongest and most original in the collection. Anthologies of such high quality are rare gems.